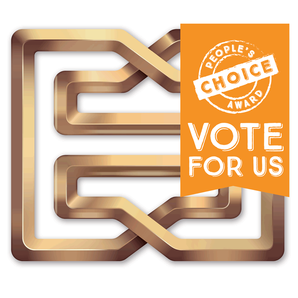 Click on the image to vote for the Hellenic Club. You can win a holiday to Hamilton Island, provided you're an ACT resident. 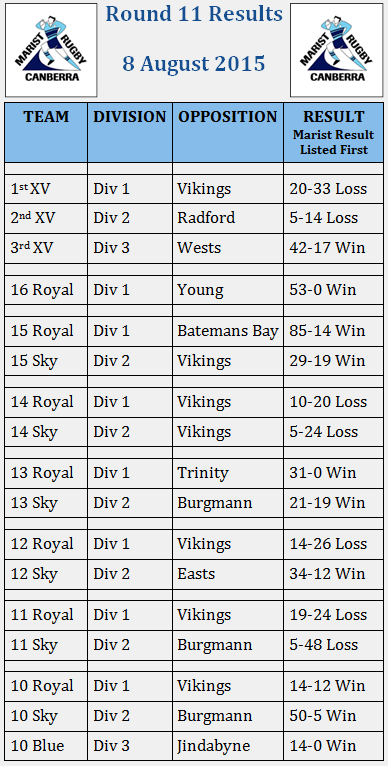 1st XV def Vikings 27-17. Thanks Sarah Mead and Jacinta Kearns for the correct score. An awesome win to finish the home and away games and lead into finals. 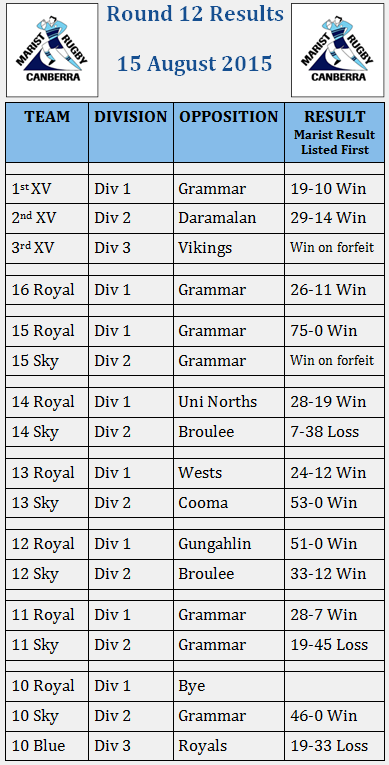 2nd XV def Broulee 31-14. Webmaster was there taking pics. Great game. Once again, Broulee never gave up, though a few exhibited grub-like behaviour and weren't pulled up for it. 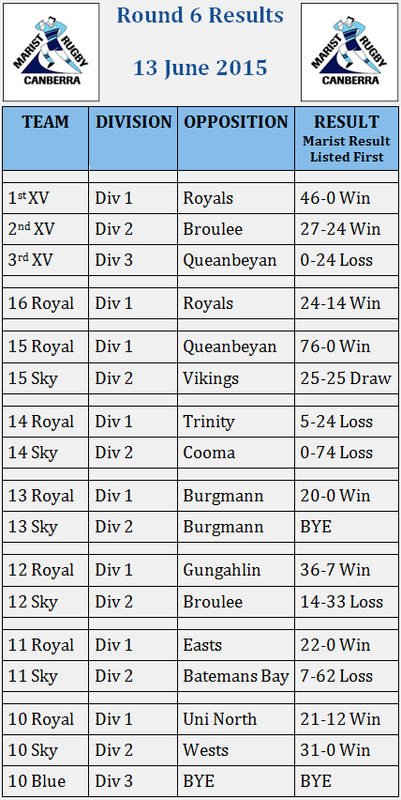 3rd XV def Goulburn 19-17. And Happy Birthday Marshy. Beating Vikings - great present from your team. Edit: 11am Sun 21Aug. 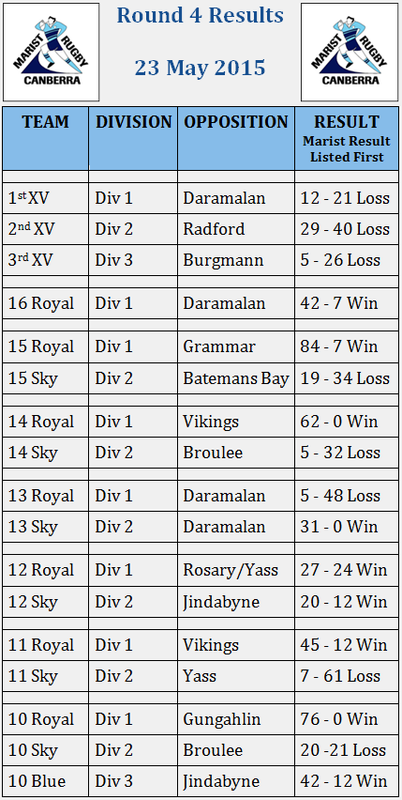 Results aren't in Rugby Link yet. Senior Dinner payment by Thurs 25th. ​A huge thank you from the Marist Rugby Club Committee for generosity and attendance of so many Marist Rugby families and supporters. The Dinner was a HUGE SUCCESS with over 150 people enjoying a great meal at the Hellenic Club and a very successful auction event with fantastic profit of approximately $11,000! Thanks to all those involved in making Marist Rugby Club a strong community and enjoyable rugby experience for our boys. The profits from the evening will make a huge difference to our boys and we are thrilled that the Marist Rugby community came together in such a generous and supportive way for our teams. Good luck to all the boys, coaches and managers as we head into Finals. 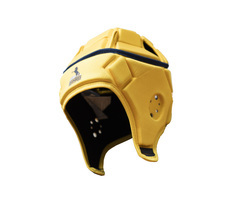 Brumbies branded head gear by Gilbert is now available. 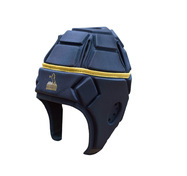 The headgear comes in navy or gold and in 4 different sizes. We have local comedians, great decorations, auctions, door and table prizes, great food & company and free drinks. All you have to do is buy a ticket, turn up and enjoy yourself. Printable Word document below - pass copies to your friends! 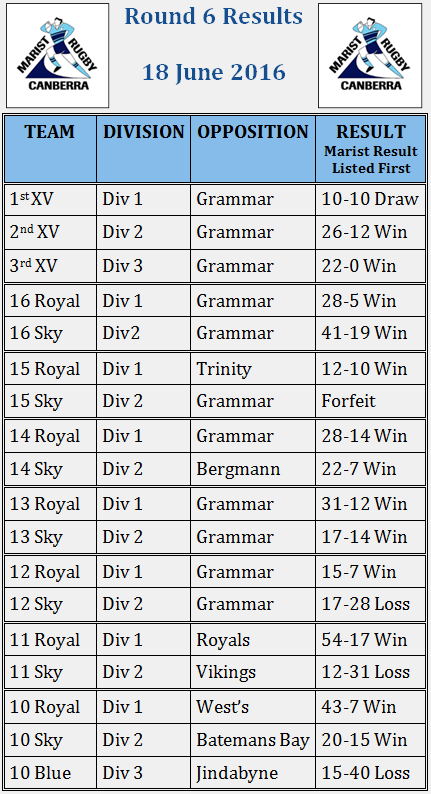 The U16 Sky game was forfeited by Eddies who had uncontested scrums. The game was played and finished 19-19. Marist was awarded the win. Once again it is photograph time and we want to make sure we have these moments for years to come. 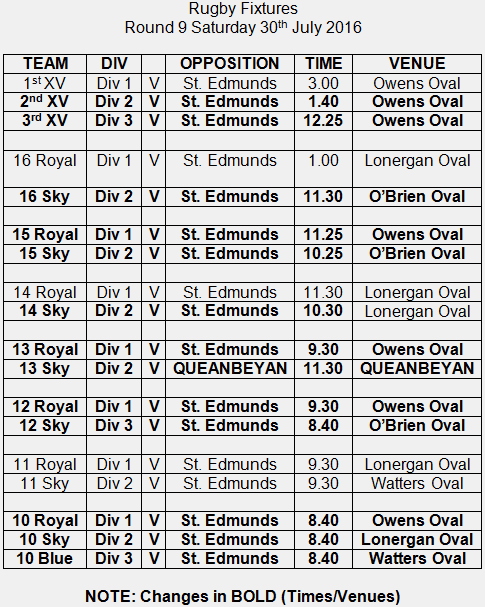 Due to last week’s ACTJRU washout, photos will be taken this weekend at St. Edmunds College. All players are expected to be present for the team photo even though you may not require an individual photo. 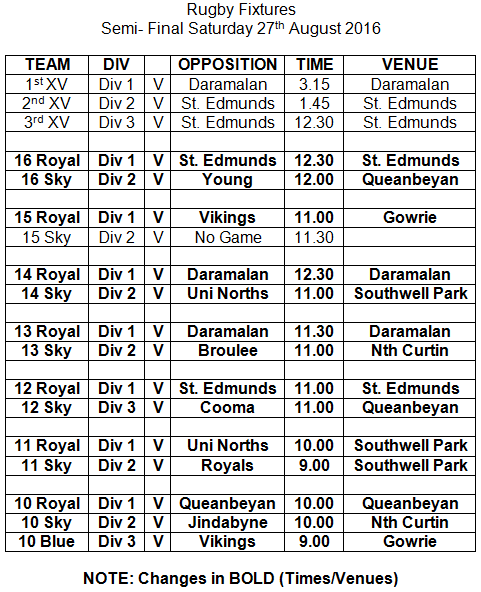 Photos will be taken on the top Soccer field at St. Edmunds College and in the College Pavilion on the Wednesday. Please be punctual as we need to keep this schedule on time. Envelopes are being distributed and all teams will have them by Thursday Term 3 Week 1. Support the boys taking on the weather and the opposition. Boys rugby only works with help. New on-line way to volunteer. Access Code Hint: What did Marcellin create (six letters)? We don't sell on-line, you have to come to the rugby. Viewing game photos and match reports enhances parents and boys enjoyment of our great game. Volunteers are needed to make that happen. E-mail your name, team and preferred role (photos and/or reports) to the webmaster, who will otherwise harass Team Managers who are responsible for canvassing volunteers from the team's parents. A great weekend of rugby, hosting St Edmunds at home. 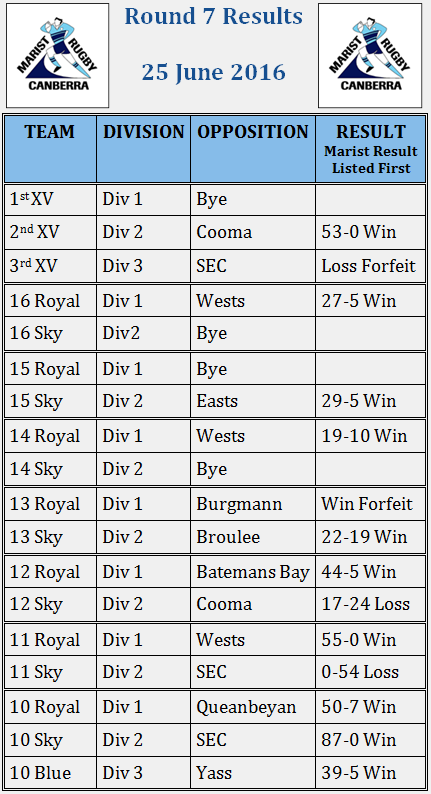 A great result for the Club; 9 Wins, 6 Losses & a Draw against Eddies, 1 Win & 1 Loss against other Clubs. Well done boys. Wednesday 4th May 6pm College Pavilion. Coaches and Managers Meeting this Wednesday. First aid kits, water bottle carriers, match balls, ACTJRU team books and orange vests will be handed out on the night. 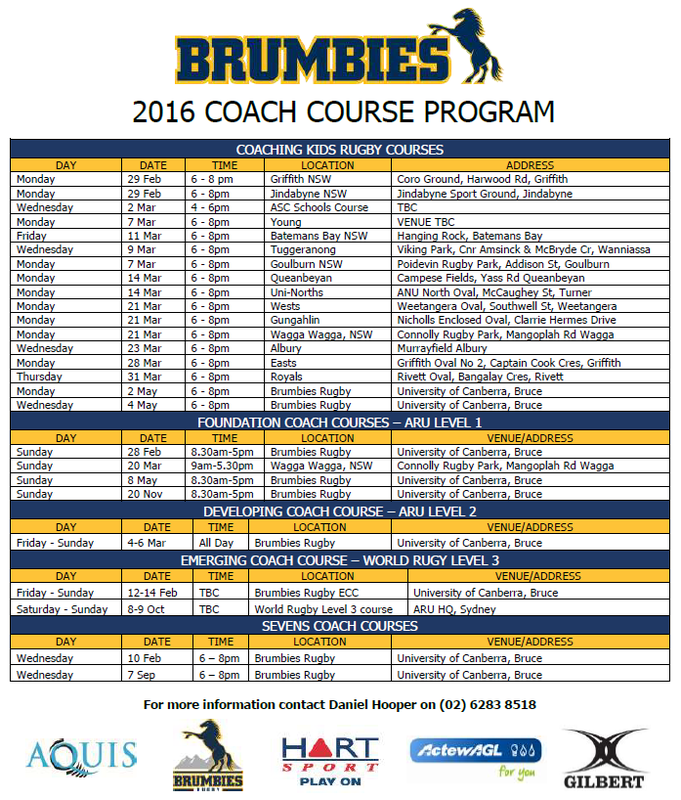 Foundation Course available on 8 May 16 at the Brumbies HQ from 9-5pm. Allows those 15 years or older to complete the Level 1 Refereeing Accreditation. 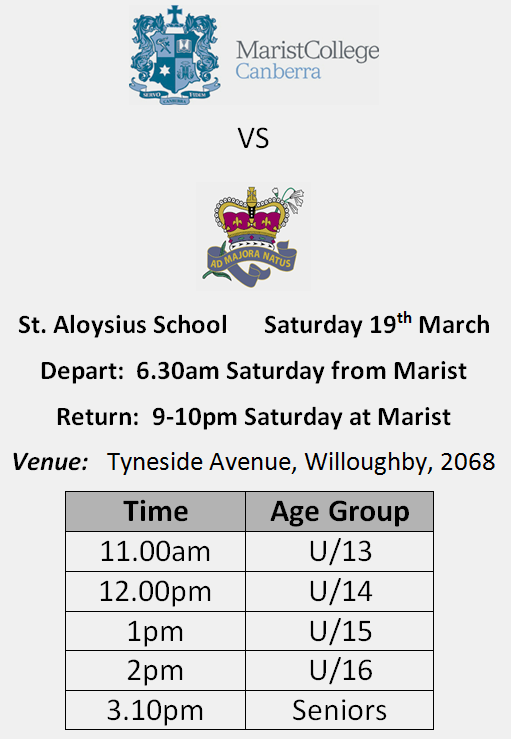 If your son is interested in attending, the Marist Rugby Club will fund his attendance. E-mail the Club President. Interested students to advise Mr. Mead by Friday 13th May. 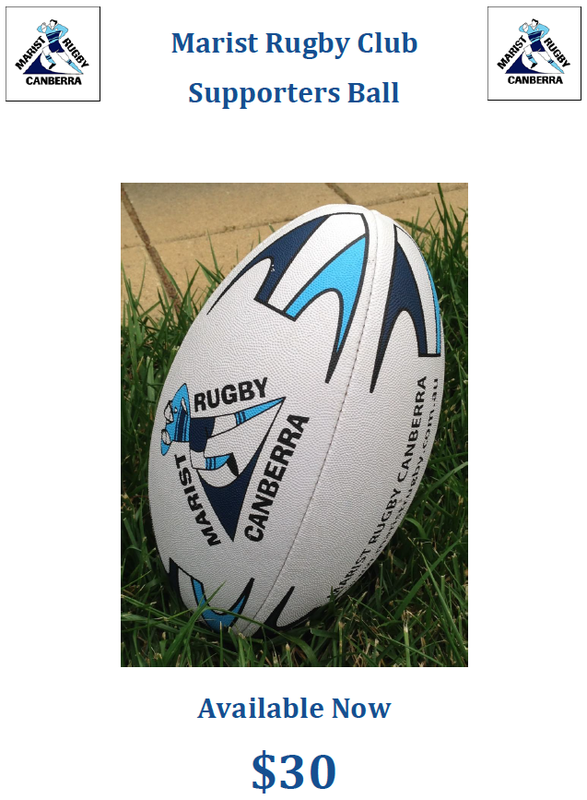 Welcome Canberra Royals Rugby Union Football Club as one of several new Silver Sponsors. 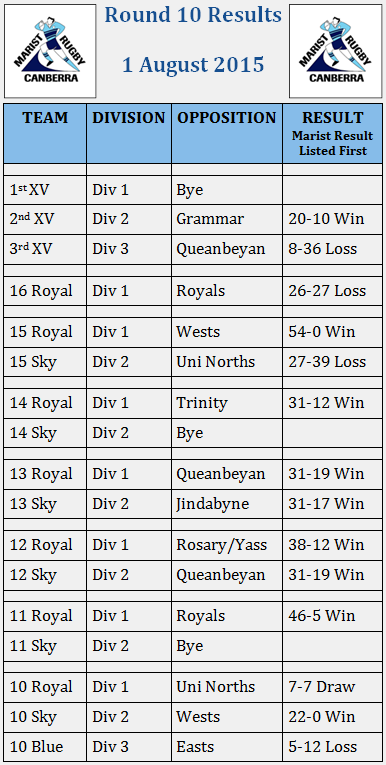 Royals and Marist have been associated since 1968 and many Royals players are Marist old boys. Fortunately, the Club has several new sponsors this year - we'll feature them - so you can support them - over the coming weeks. 1. Refereeing Kids Rugby U8s to U12s: To referee this rugby all you need to do is maximum 3hr course followed by a quick online law exam and you are set to go. This course incorporates Smart Rugby and the minimum age to do this is 13 years of age. These courses can be run at your local rugby club or school. 2. Foundation Course: To referee U13s through to U18s you need to complete the Foundation Course. In this course you are joined by people wanting to be a coach, and break off into separate groups at different points during the course. 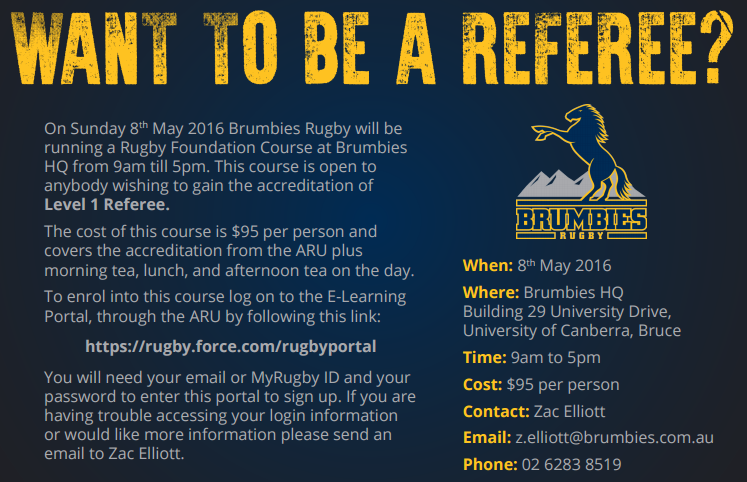 This course takes eight hours and will be run at Brumbies HQ on the 8th May from 9am till 5pm. The minimum age to attend this course is 15 years of age. 3. Touch Judge/Assistant Referee: To either one of these (they’re the same thing essentially) you need to complete a course called the Level 1 Assistant Referee. It takes three hours and the minimum age to complete this course is 13 years of age. Thank you for the many offers of volunteers we have received. We have collated the lists and the various Committee members will be in touch with you (ie the Canteen Manager will contact you if you volunteered for canteen duty, First Aid Coordinator will be in touch if you volunteered for First Aid etc). If you volunteered and don’t hear from anyone in the coming weeks, please let us know. Also if you would like to volunteer but not sure how- please contact me. Our Club runs on the efforts of volunteers – so every offer is appreciated. We have changed the night for our Coaches and Managers Information Night to 2 May 2016. More information will be provided next week. Please remember to like us on Facebook, and visit the website regularly (www.maristrugby.com.au) . These are updated regularly and are the best way to stay informed. You could collate a match report over a DB Draught too! The advice in the attached document is based on the World Rugby Concussion Guidance dated August 2015 and adapted to reflect best practice for the management of concussion for rugby at community levels of the game in Australia. 13 Apr 16. They'll be home on the 22nd. On behalf of the Marist Rugby Club Committee I would like to thank you for registering your son to play with Marist Rugby in 2016, and we all look forward to a great season. Hopefully I wont email you too often, and when I do, I will try to keep them short and clear. Communication with you is a priority for me, so any suggestions you may have regarding communications are welcome- please email me or our Secretary at maristrugby@gmail.com. Registrations are being finalised now, and in consultation with the Rugby Master (Paul Mead) and Committee, will be finalised this week. U10s, Seniors and new players receive a Jersey. I will email these families separately with information. We will have a brief Information Night for our coaches and managers. This information session will outline roles, responsibilities and the support we provide to you in these volunteer roles. If you are considering helping out as a Manager - please let your coach, Paul Mead or me know. Our sport operates through volunteers and your contributions are greatly appreciated. We will be providing a Coaching Guide this year and it will be tabled at the Coaches and Managers evening. The Guide is intended to outline skill development in each age group, plus general information. If you have any suggestions for what it should contain, please let Paul Mead or I know. A separate email will be sent to 2015 and 2016 coaches seeking input/consultation. As you may know, we have engaged two professionals to work with the Club in 2016 to provide Skill Development support (across all age groups), and Strength and Conditioning (U16s and Seniors not in Rep teams). This is a great addition to our rugby skill development. If you would like to know more, please contact your coach, manager, Paul Mead or Committee. As you know, safety is our number one priority for our boys. Each team has a dedicated first aid volunteer (or several). These people are parents/carers and we will fund your First Aid Training. First Aid volunteers will also wear a vest, and be supported at home games and Garran oval games, by professional medical staff. If you are interested in volunteering, please contact the Committee. Many boys have expressed interest in being referees, please click the link on the ACTRRA home page and complete the online registration.Once complete you will then need to EFT your subs to the association. Only after you have registered and paid your subs, will you be fully registered and thus insured and able to be appointed to games. The RugbyLink E-Learning centre is working and all relevant courses including Smart Rugby can be done online. Again the link is on the Home Page of the ACTRRA site. We will hold our annual Marist Rugby Dinner on Saturday 13 Aug 16. We hope each team will have a table and its a great way to get to know the Club and other parents in your age group. More details to come. 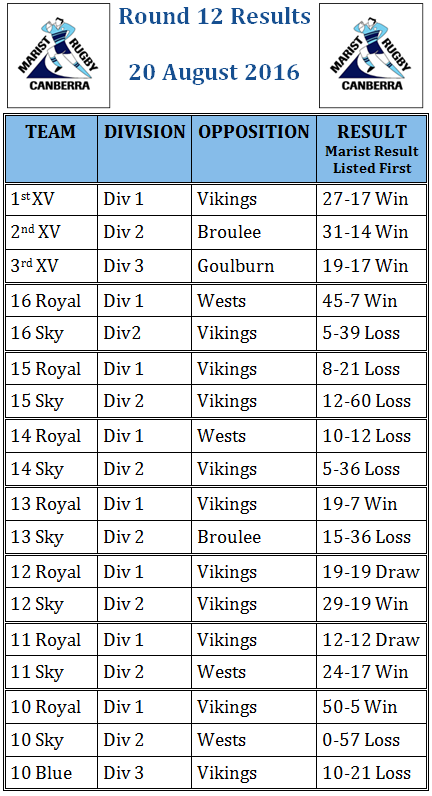 Please remember to like us on Facebook and regularly check the website www.maristrugby.com.au, we update these almost daily and also upload photos, results, game details etc. Its a quick and easy way to stay up to date. The website also provides Committee information if you would like to contact us. Thank you again, and apologies for a long email. Looking forward to a great season and fun, successful, safe games. 2016 Registrations are now being accepted online. 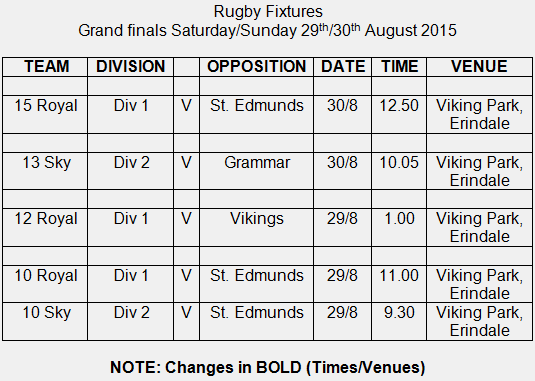 Unfortunately the RugbyLink system is not working correctly so processing is via the ACTRRA website. Please click the link on the ACTRRA home page and complete the online registration. Once complete you will then need to EFT your subs to the association. Only after you have registered and paid your subs, will you be fully registered and thus insured and able to be appointed to games. If you have any questions please contact us via return e-mail. Still space available at the camp and ARU Pathway scouts will be attending. Please see the attached flyer for more details or go to www.campwallaby.com.au and click on the ACT Event at Scots for more information. ​The Working with Vulnerable People (Background Checking) Act 2011 (the Act) commenced on 8 November 2012, with individuals volunteering in 'Activities or Services for Children' having until 8 November 2015 to become registered. This affects our coaches, managers and volunteers working with Marist Sporting Clubs, who are over the age of 16 and are not current students of the College. Registration is required by all individuals engaged in activities (other than an overnight camp for children) for more than 3 days in any 4-week period and 7 days in any 12-month period. Read the attached notice from the School below, then do it. Protect yourself and the School from penalties under the Act. The information night was very successful with well over 50 people in attendance. There have been a few inquiries from parents who were unable to attend, so the Rugby Master's presentation is attached. The information night will provide parents with necessary information for the season. The Club doesn't operate without volunteers and as always, many hands make light work. We need marshalls, canteen and BBQ staff, first aiders, photographers, match report writers and of course, coaches!! Any assistance you can provide (from one hour on a BBQ to assisting with First Aid or Coaching) is GREATLY appreciated, otherwise many of these requirements are met by creating rosters. Please also remember the Club funds your First Aid or Coaching training. If you have not yet registered your son, read the instructions at the Registration tab. Registration closes 15 Mar 16. Please see attached DRAFT calendar for coaching courses next year, as you will see there are NO SMART RUGBY courses listed. Of important note for 2016 is that Smart Rugby will become an ONLINE COURSE. Coaches will simply register on the new ARU online portal (which will open form January 1st) and complete their Smart Rugby accreditation online. As a result it is hoped that clubs will encourage new and learning coaches to attend a Coaching Kids Rugby Course or a Foundation Coaching Course in future. We are also excited to bring 2 new coaching courses in 2016 – the 7’s coaching course, and the Emerging Coaches Course. Of particular note are the below 2 courses for your aspirational coaches. Please forward this email to any of your coaches who you believe are at the desired level to complete these courses below and they can contact me for further information. Target Group: Coaches at U16A level and above, including Junior and Senior Representative coaches. 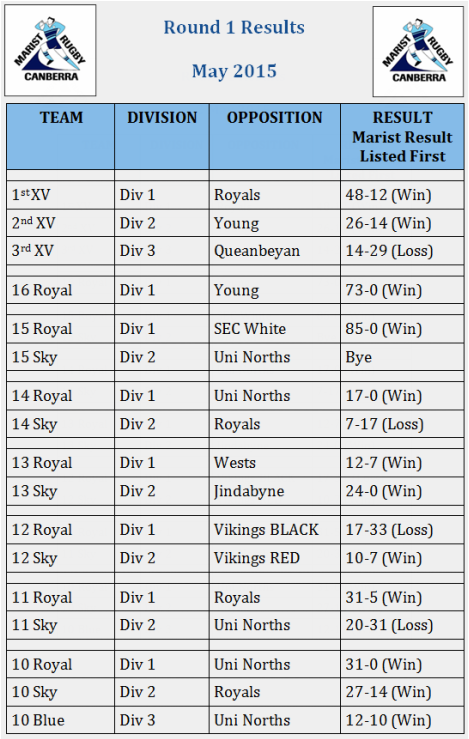 Target Group; Coaches at First XV Level or above including Representative coaches and aspirational Senior grade coaches. Dates; February 12th - 14th @Brumbies HQ, and October 8th - 9th @venue and exact dates in October are TBC. These 2 days are run by the AU and World Rugby. Notes; The program includes a number of opportunities throughout the year including coaching opportunities at Brumbies Emerging Talent Camps, free attendance at Brumbies Advanced Coach Seminar, plus further opportunities in the High performance area. This course will sit between the current ARU Level 2 and ARU Level 3 course, but on completion of the program coaches will receive full World Rugby (IRB) Level 3 accreditation. A great evening at the Hellenic Club last night, good food and company, and an opportunity for all involved to express appreciation for everyone's contribution that makes Rugby the great game that it is. 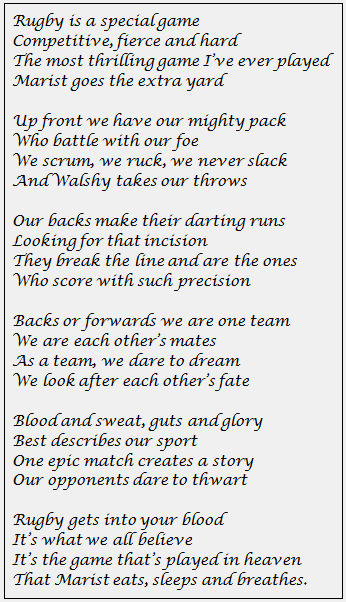 One of many highlights of the evening was the captain of "The Mighty Thirds", Dominic Maher, reading a poem at the end of his speech, below. 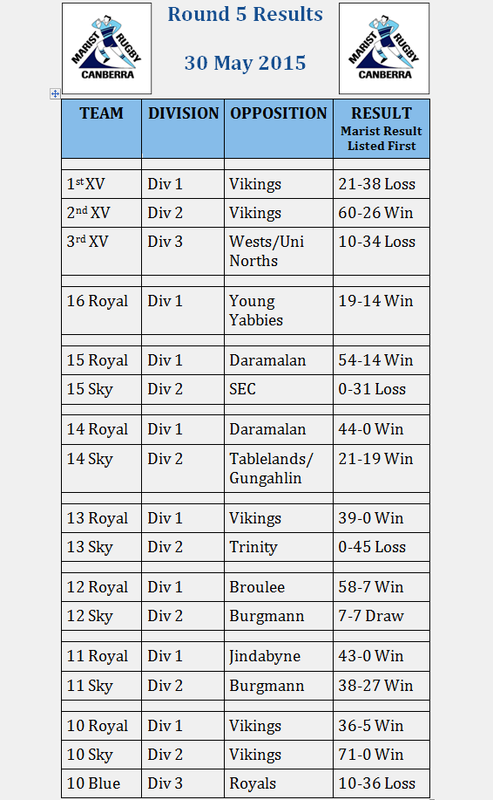 Congratulations to the U15 Royal Team!! 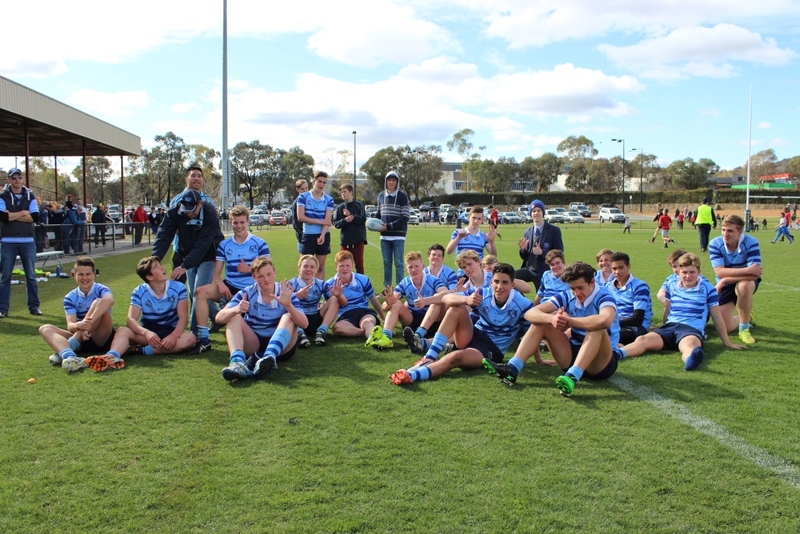 Winning the Grand Final v Eddies 17 to 15. After a false start last week due to snow, the Brumbies were able to come help out training the U10-U14 teams on Monday - just awesome!! A great motivator as 13 of 17 teams compete in finals this weekend. If you want a higher quality copy of any of the pictures below, go here. On behalf of the College and the Marist Rugby Club we would like to again thank you for your time, your effort and your generosity. It is only your support that makes it possible for us to continue to offer the rugby experience to the boys. The Club is hosting a Junior Presentation Afternoon for the Under 10, 11 and 12 teams. This will be in the Senior School Gymnasium on Wednesday 9th September, commencing at 4.00pm. All boys are able to stay after school and the Rugby club will provide a packet of chips and a juice as afternoon tea. Year 5 boys will be returning from camp around 2.30pm and will attend the presentation in their casual clothes. We are hoping that this helps alleviate the long evening and still provides the opportunity to recognise the junior players for all their efforts during the season. 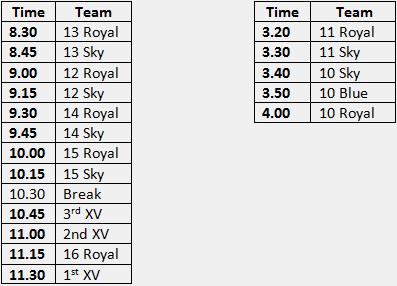 To make this a special occasion for the juniors the College 1st XV will be the event managers for the afternoon. The captain will M.C the Presentation. The Under 13, 14, 15, 16 and Senior teams will enjoy a more condensed program at their traditional Presentation Evening on Wednesday 9th September, in the Senior School Gymnasium starting at 7.00pm. We encourage all players to support the presentation and to come along with their parents. Boys are required to be in their Full College Uniform. 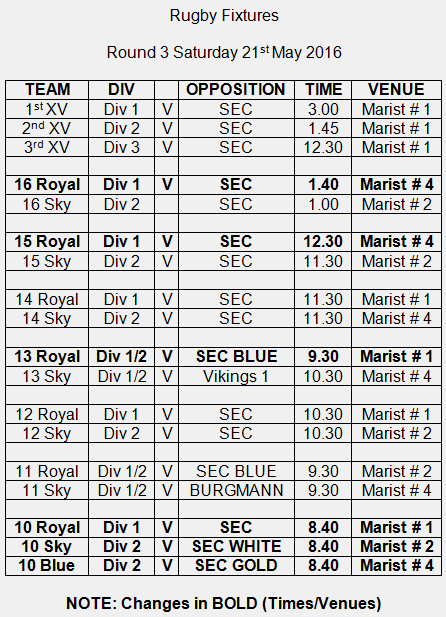 Once again, many thanks for your generous help and support of Marist Rugby. We trust that you have enjoyed the experience and we look forward to your continued involvement. The Brumbies will attend training sessions on Mon 17 Aug. We know some junior teams don't normally train on Mondays, but there are some one-off arrangements being put in place - contact your coach or team manager. Select "Dinner Dance" on the left menu to buy tickets (now) and bid on auction items (from Monday 17 Aug). C'mon get with the program, get a table together and get your tickets. Half the tickets have already sold. Ticket sales will close on Tuesday to finalise numbers. It promises to be a fantastic night out!! MERCHANDISE STAND OPEN THIS WEEKEND! 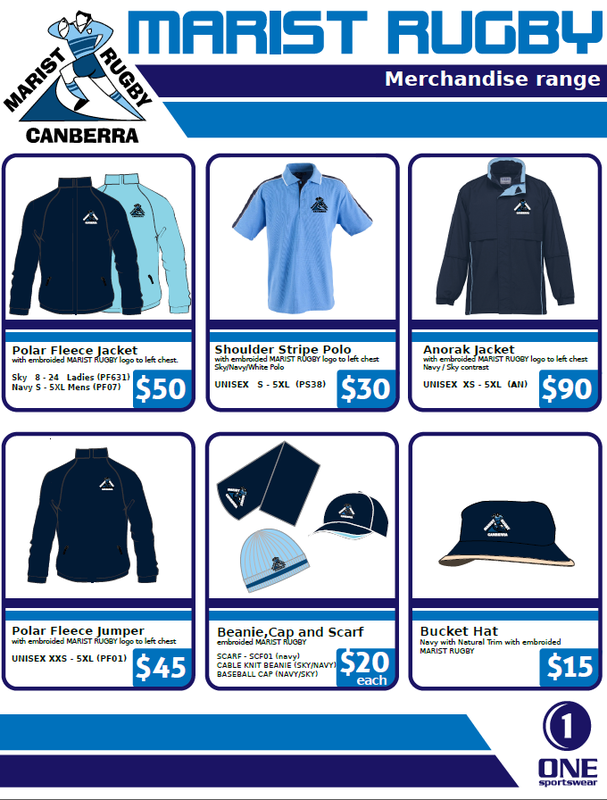 Our merchandise will be available for sale this Saturday at our home Gala Day near the canteen. Ideal end of season gifts for our Coaches & Managers! Once again it is photograph time and we want to make sure we have these moments for years to come. 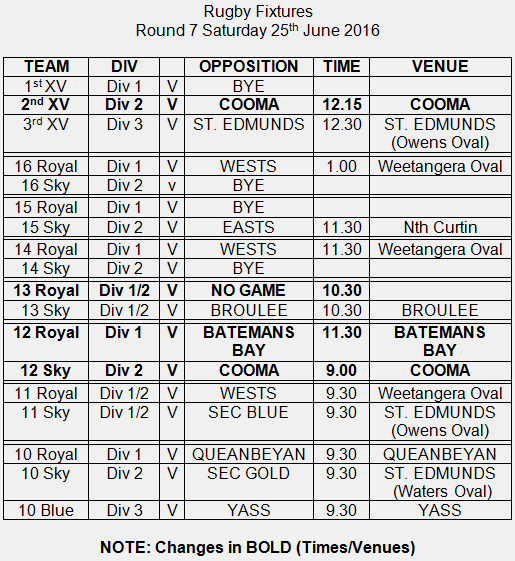 The schedule below coincides with the home round and is the best fit. All players are expected to be present for the team photo, even though you may not require an individual photo. Photos will be taken in the Senior Hall on the Saturday and the Pavilion on Wednesday. Photos will not be returned until the end of the season to allow for titles to be added regarding the season's performance. Please be punctual as we need to keep this schedule on time. Envelopes are being distributed and all teams will have them by Thursday. 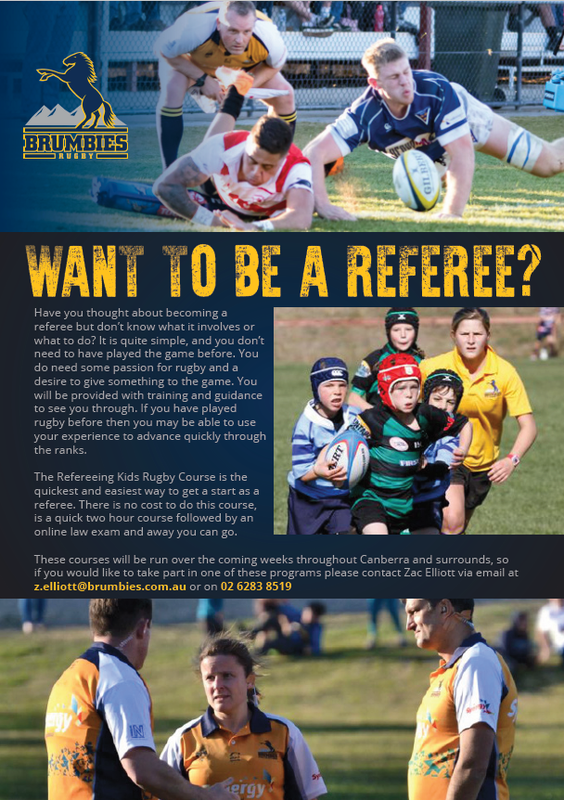 A refereeing kids course is being held at Brumbies HQ on the 4th of August. 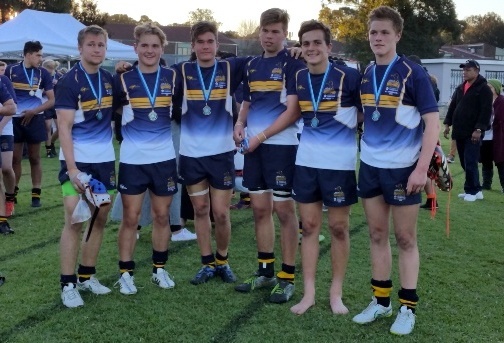 The U16 are NSW champions. Undefeated in 9 games. They scored 244 points and only 22 points were scored against them. 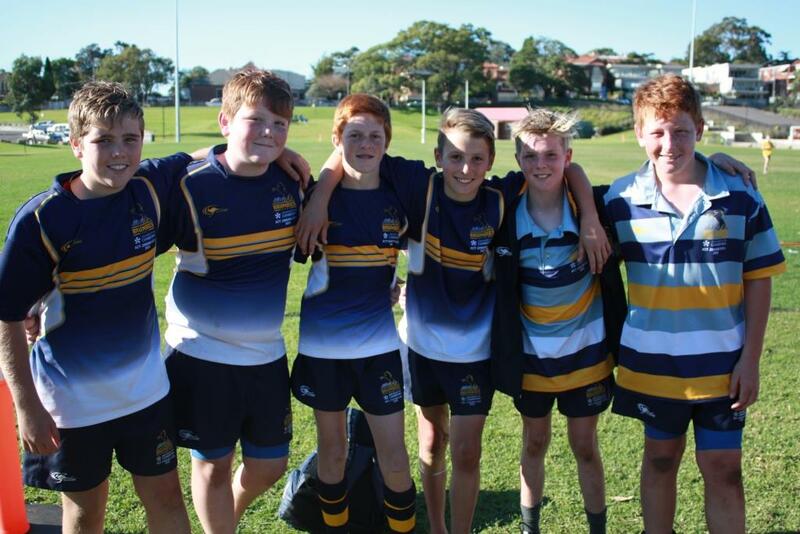 Congratulations to the U13 Marist boys who competed in the NSW Rugby State Championships at Drummoyne Oval over the long weekend. They are Joel Leiper, Mitch Rainey, Ryan Maguire, Jayden Peckett, Will Hayes, Kane Smith. You'll get the clinic, fed twice & a bunch of Brumbies stuff!! Download the below file for more details. Marist U13 Boys are the stars in AQUIS Brumbies Landrover ad! Update 27 May 15. 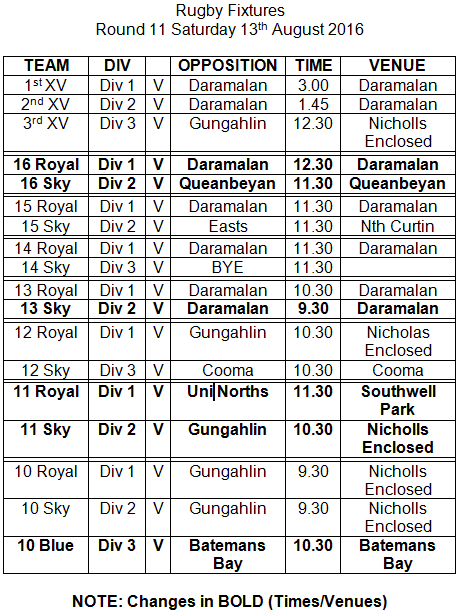 The attachment is now out of date, but if you need to plan your life beyond this week's game (Round 5) it is still worth a look. Note that whilst we missed issuing a weekly draw for a few weeks, we're back on the ball and you'll get accurate weekly draws from here on. 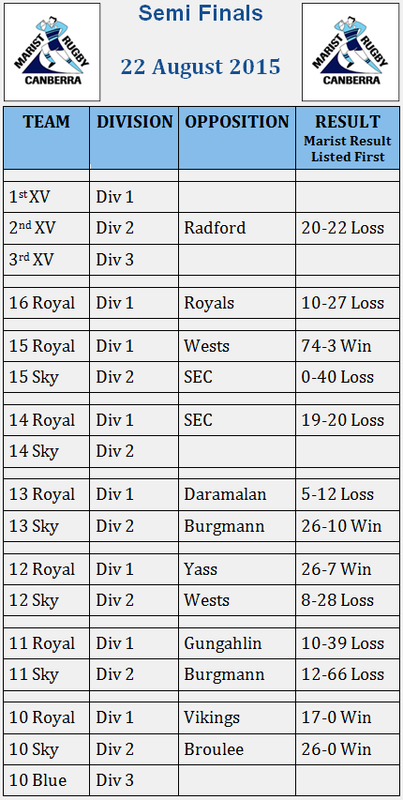 Team Managers are of course welcome to split up rosters as they see fit, but a copy of the U11 Royals roster, on an excel spreadsheet, was shown at the Committee Meeting on 28 Apr 15. It is included below to save producing one from scratch. 16 HOME GAMES AGAINST EDDIES! 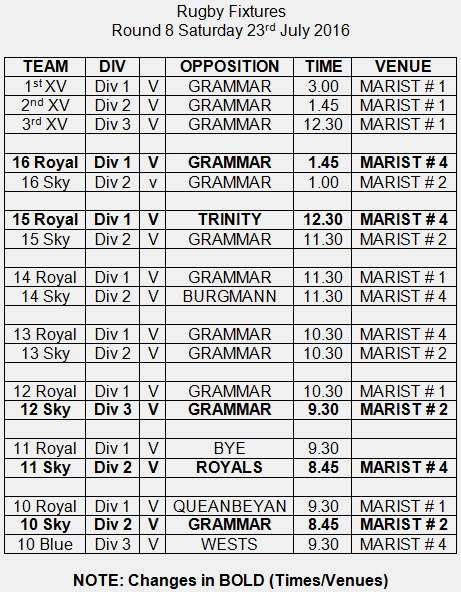 A huge day of rugby with Marist hosting St Edmunds College in 16 of the 17 games. 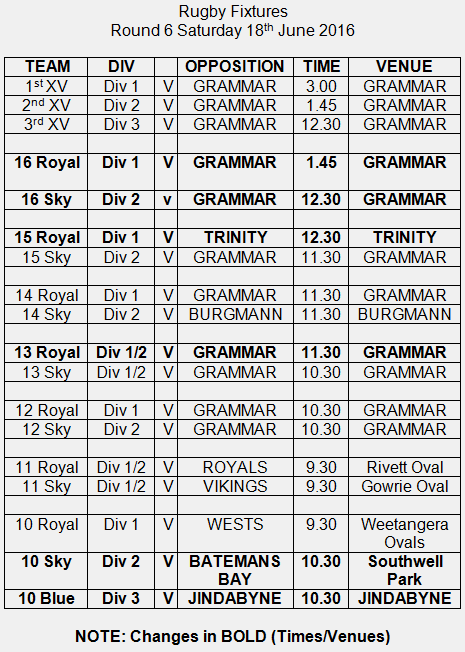 It kicks off with the U10s at 8:40am and finishes with the 1st XV game at 3pm. Also, some of the Club Sponsors will have displays. The weather also looks great (see right). 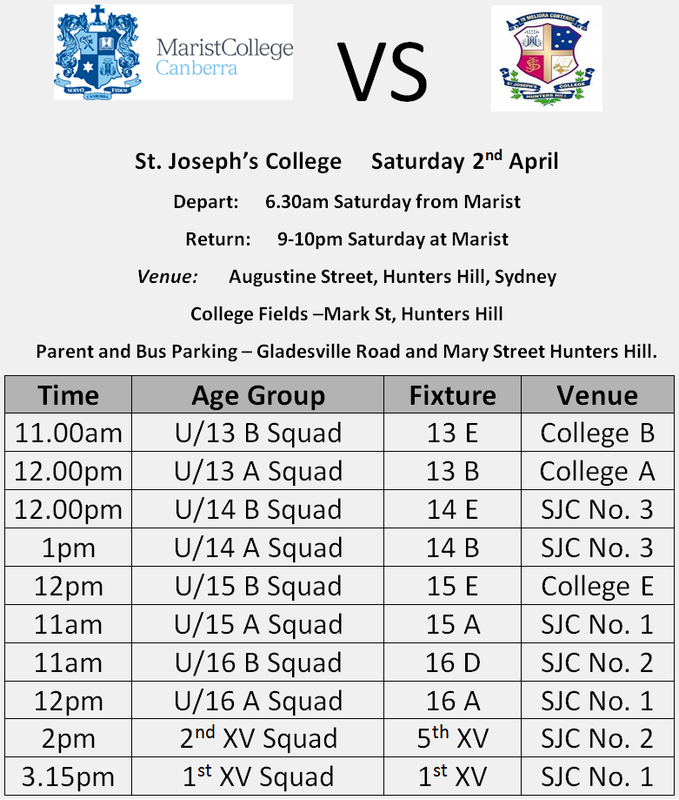 The atmosphere will be great, so we look forward to seeing the Marist community show up in numbers. GO MARIST! Players are required to arrive 30 minutes prior to their age groups scheduled start time to register. 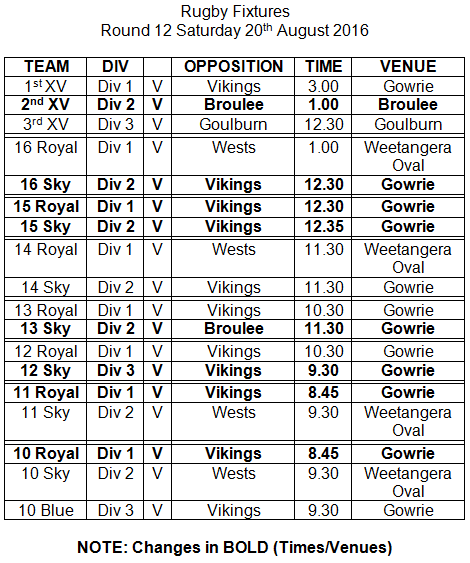 Also the ACTJRU Under 14’s & 16’s and Junior Gold Under 15’s will play NSW Country Juniors on Sunday the 19th of July in Canberra – Venue and times to be confirmed. Upon selection teams will train each Wednesday and Sunday leading up to the long weekend. Each Management Team will advise of their teams specific requirements. Don't forget to volunteer this season; at least don't shirk the canteen roster - yes, there's a roster. So, help in the Canteen or become an Iron Chef!! Or be a Marshall, or take photos or write match reports, or e-mail Scott and tell him you want to help. And please don't forget we're here for the boys to enjoy their rugby. Don't be ugly. See the information sheets below. 1 Apr 15 at 6pm in the Pavillion. Training begins Week 6 (10th March) for the boys so please see below the Season and Preseason schedules, the latter with training days and locations. All training will begin at 3:30pm and finish at 5pm. 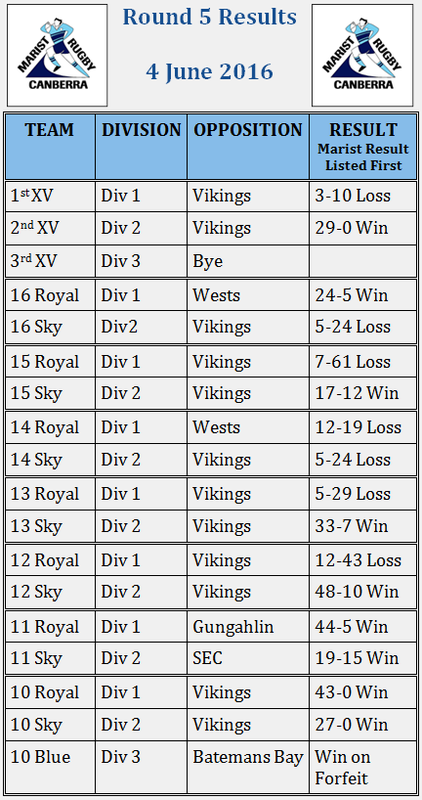 For those of you who are new to Marist Rugby, welcome to the club! 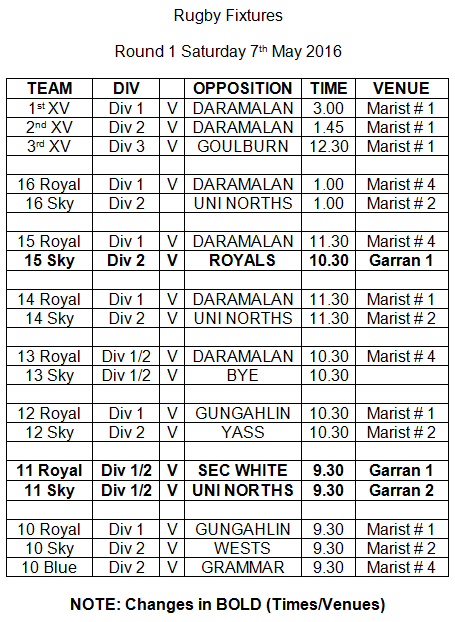 Please note that due to the number of teams we have some training sessions are held off-school at the Melrose School oval which is down the road from the school, and the Pearce oval which is opposite the Pearce shops. Also, Marist No. 1 oval is located in front of the main grandstand, No. 2 oval is behind the grandstand and No.4 oval is next to the cricket nets. Have a great season and we look forward to seeing you around the grounds. 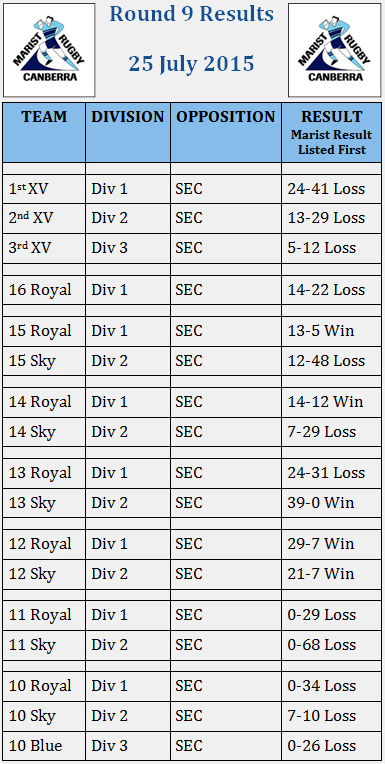 There have been some substantial changes in rugby, including the funding arrangements for junior rugby. This letter went out to all parents prior to registration, but a copy is below for anyone who needs to refer to it. It also includes acknowledgement of our sponsors and sponsorship arrangements for 2015, announcement of the 2015 committee, continuation of the new role of Director of Coach Education and of course, a reflection on the success of our boys in the ACTJRU competition and in various representational roles. Marist School Pavillion - Thursday, 23 October 2014 at 7pm. We would love to see as many of you as possible come along to our AGM and get involved in our committee for next season. 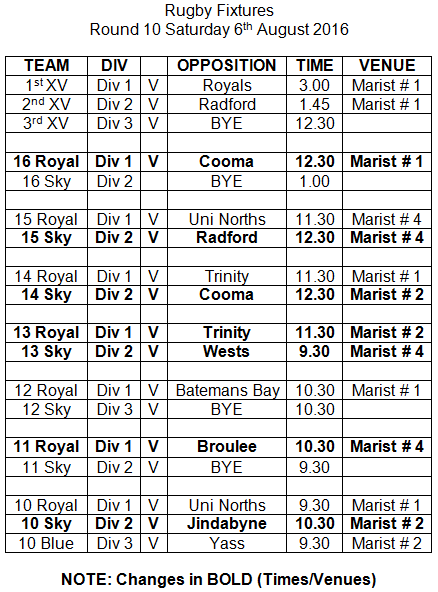 It is a massive undertaking to get over 400 boys on the field each week and we encourage everyone to continue supporting Marist Rugby. In addition to the dedicated support of many of the teachers, there are many dozens of parents that fill the roles of coaches, managers, ground marshalls, canteen staff, match report writers, photographers and so on. They all need to be supported by a committee able to assist the school in ensuring the boys have the equipment and training they need to be successful. So come to the AGM, Get a better understanding of what goes on to get your boy on the field each week and seek to find a way you can help. Even if you don't know much about Rugby, there are many roles both on and off the committee that will enhance your boy's playing experience. 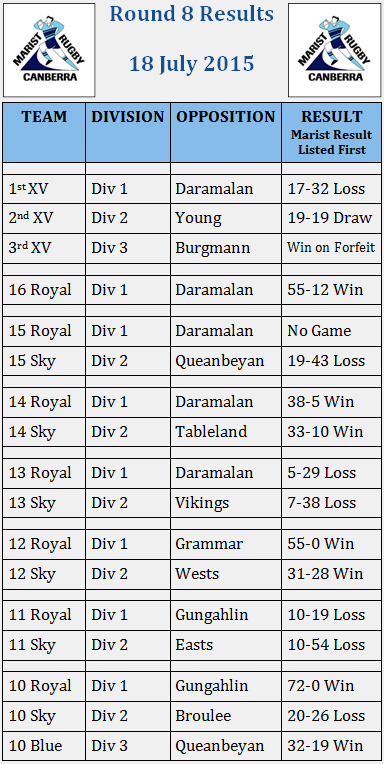 And if you need some convincing that your efforts will help ensure the boys success in their rugby endeavours, ﻿read about this year's finals﻿. Now that the 2014 season has come to an end we would like to again sincerely thank our sponsors for their continuing support. We are proud to be in partnership with the organisations below and we are delighted that they have chosen to help the Marist Rugby Club. So please help them to continue helping us by giving them your support whenever you are able. 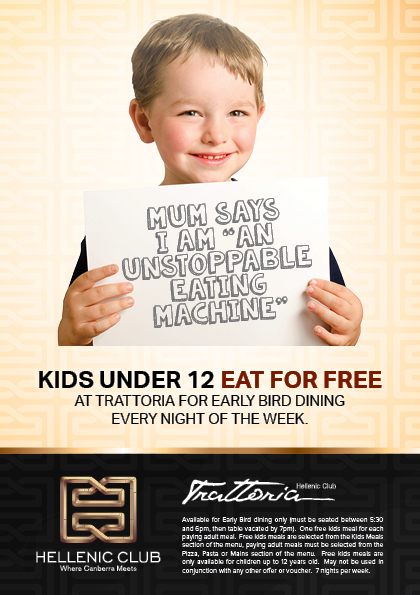 And for the Hellenic Club, click here if you have kids under 12. 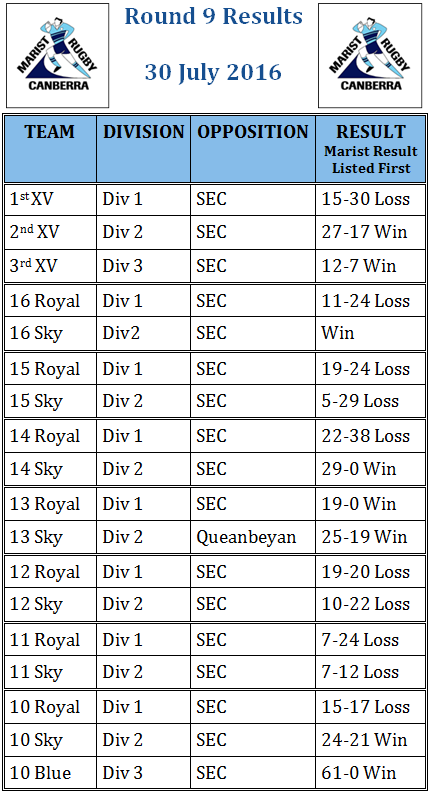 Well, it's been quite a season, 22 of 23 teams made semi-finals, unmatched across the ACTJRU, Eleven of these teams made grand-finals and five won. 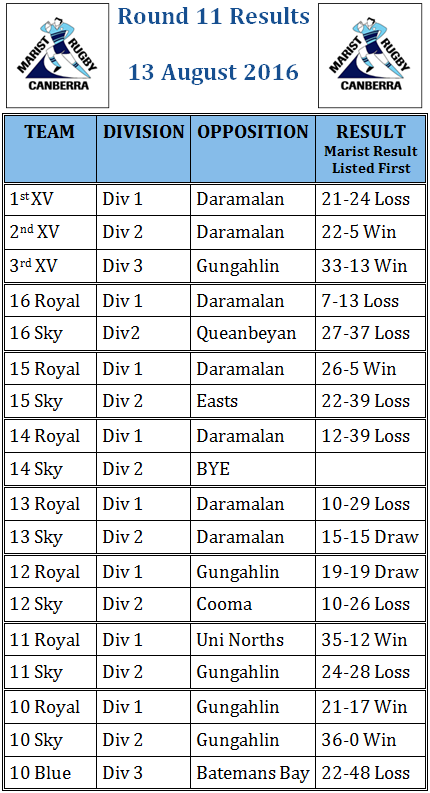 While the senior teams struggled, look at the results for the junior teams!! 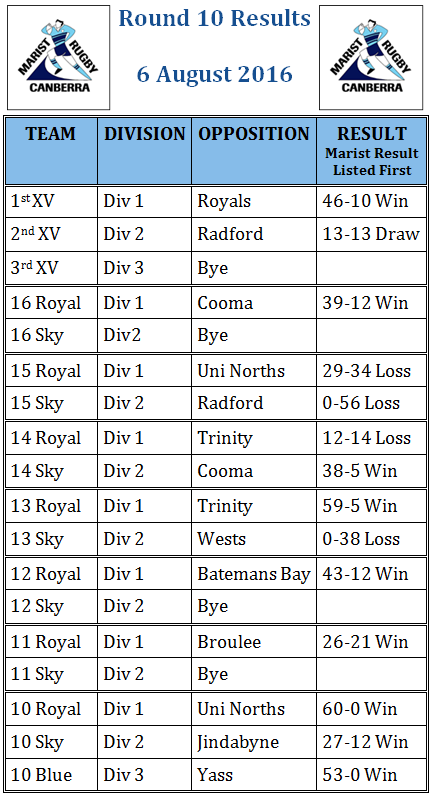 U10, U11, U12 and U14 Royal teams all won, with U13 Royal not missing out by much. 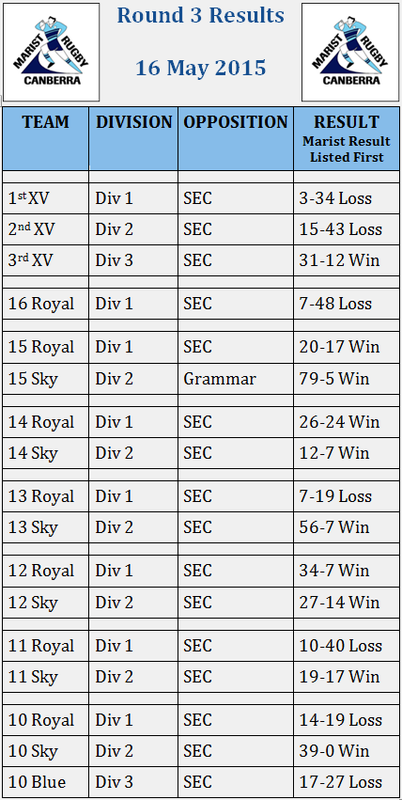 Some might say the U15s were hard done by in their semi (straining to remain polite and respectful here) and the U16 Royal and all the senior teams have struggled with player losses to other opportunities early on and later, to an unprecedented number of injuries. Notwithstanding those player losses, in a thrilling game with the lead changing several times, the Marist 3rd XV defeated St Edmunds 14 to 12. One of the English boys on exchange from Kelly College, Tavistock, Taylor Ryan, came onto the field at about the 20 minute mark, with Marist down 3 to 5. A few minutes later, close to the Eddies line, he peeled off the left side of the scrum with the ball and in great English rugby style, drove under the defence and just managed to jam it over the line, making the score 8 to 5 in Marist favour. A few minutes later, Taylor Ryan was injured, half time called and the game delayed awaiting an ambulance. As the second half wound down, Marist kicked a penalty and Eddies scored a converted try, putting the latter one point in front, 12 to 11. Tensions were high - given the interruption due injury - it seemed only the referee had any idea how much time remained. Marist were awarded a penalty at about Eddies 22 and set up for a kick. One of the Eddies boys momentarily forgot the rules, charged down the kicker, kicked the ball away himself and scored a yellow card for his trouble. Marist converted, went two points in front and two minutes later it was all over. 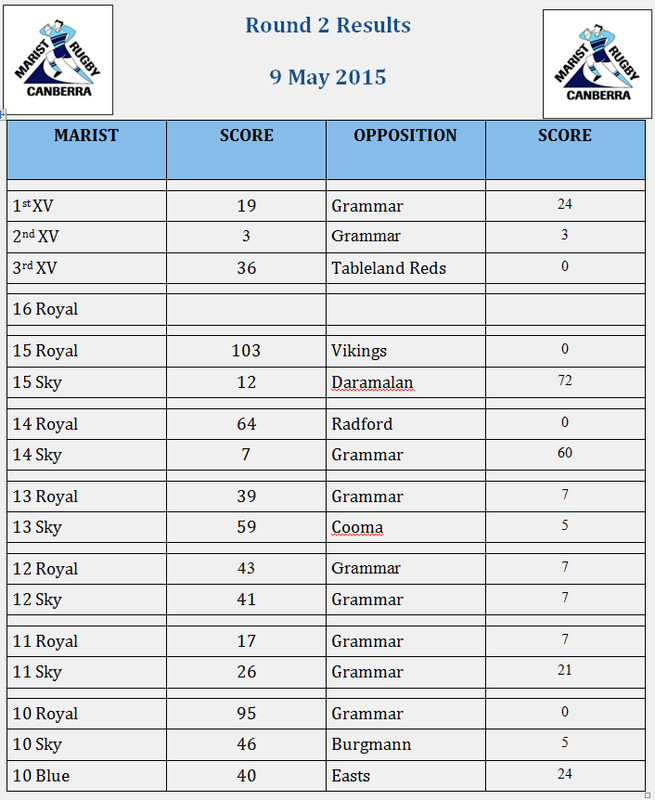 Marist won 14 to 12 and prevented an otherwise Eddies clean sweep of the senior divisions. 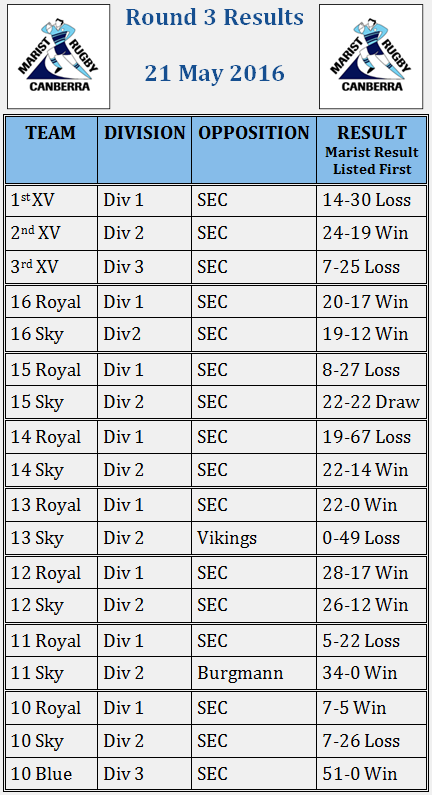 Anyway, on the basis of the junior results in particular, the future of Marist Rugby looks really, really good! Congratulations to all our boys and young men for their dedication throughout the year, regardless of the result. And thanks to the volunteers - coachers, managers, marshalls, canteen staff, linespersons (how PC), photographers, match report writers (need more of them next year) and of course to the referees (yes, the senior refs are unpaid - they do it for the love of the game). And thanks to everyone who came to the dinner - it really was great night out!! 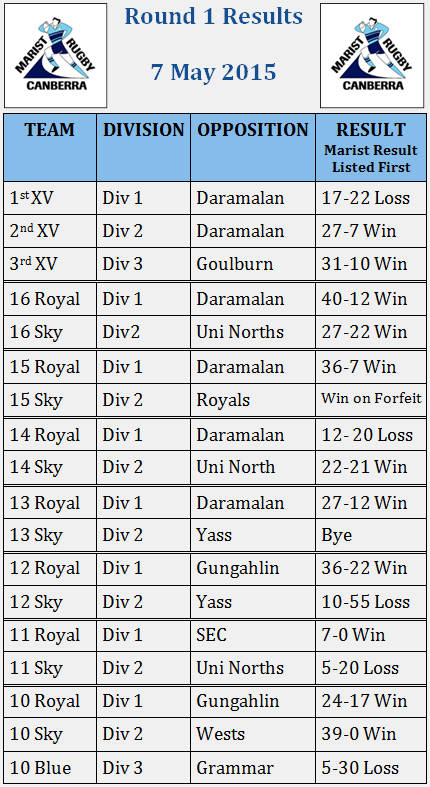 It’s great to see 11 of 22 semi-finalist teams win on the weekend. Congratulations to all our boys and young men who have made it to a final! 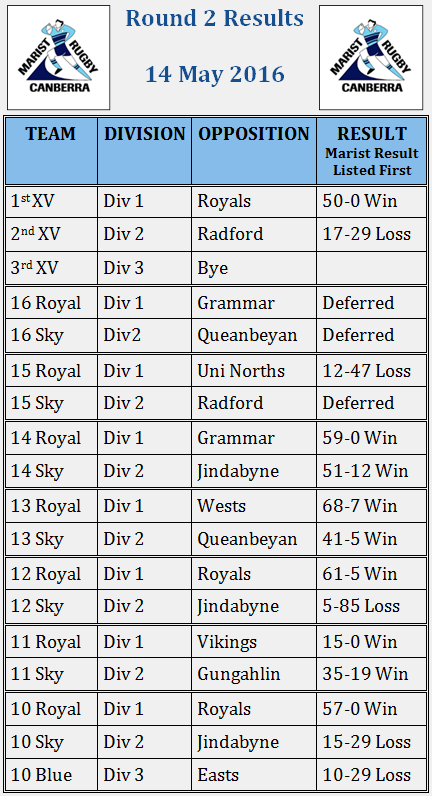 The U16 Sky, relentlessly attacking the Eddies defence, then at full time Eddies incurring penalty after penalty, until the referee awarded a penalty try, with Marist converting to win [in the other semi-final 1st placed Uni North beaten by 4th placed Radford]. It means a 3rd vs 4th final-awesome!! Congratulations to all the boys whose teams unfortunately didn't win, including our 1st XV, for showing the determination and teamwork to get to the semis and for reflecting the positive personal qualities and spirit that make rugby great. So, get to the finals and support the boys. The draw for all finals is below. Good luck and GO MARIST! 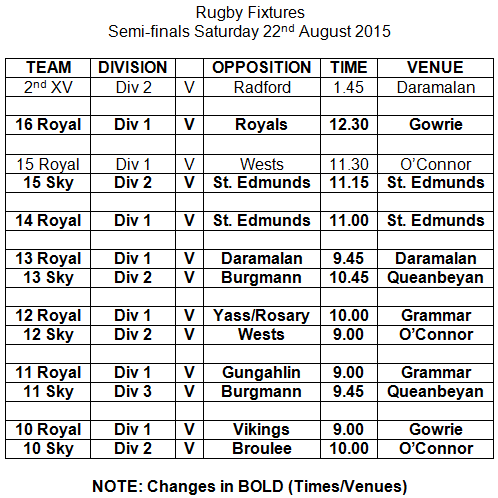 It’s fantastic to see 22 of our 23 teams are involved in the finals this weekend. Congratulations to everyone who made the finals! Congratulations also to the Under 10 Blues team. Boys, although you didn’t make the finals this year, we have been told that you have all played with great enthusiasm, passion and spirit and have represented our club magnificently. I know for many of you this season has been your first, and after the way you finished your last game of the season on our No. 1 oval, we are sure you will be in for a big season next year. 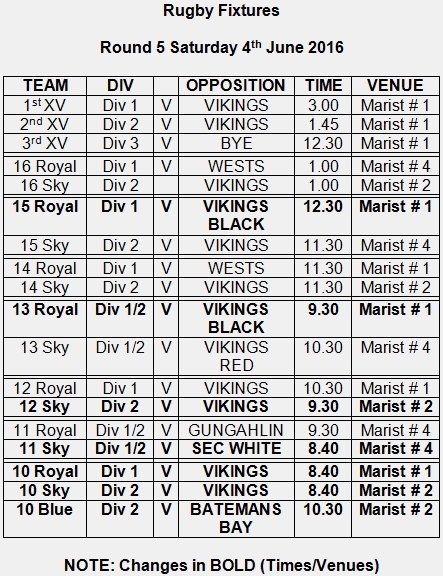 Below are the times and locations of all the Marist games, so we encourage everyone to get to the games and support the boys. Good luck to all the boys this weekend and GO MARIST! 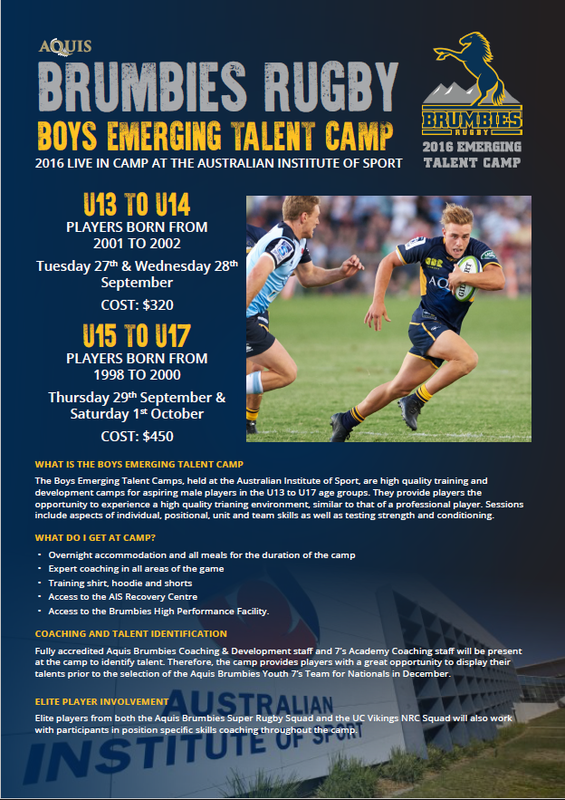 The Emerging Talent Camps are high quality training and development camps for aspiring players in the U13 - U17 age groups at the brand new UC Brumbies training centre. They provide players with an opportunity to experience a training environment similar to that of a professional rugby union player. They also give players the opportunity to be trained and identified by expert coaching and talent ID staff from the UC Brumbies and Junior Gold Cup. Sessions will include aspects of individual, positional, unit, and team skills as well as a Strength & Conditioning component. 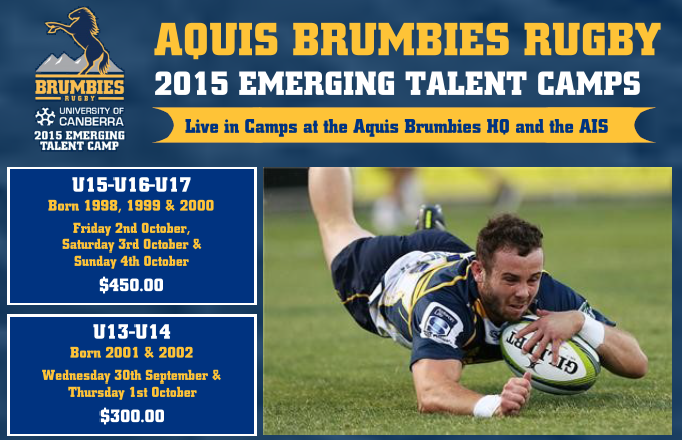 Players attending the camp will be privileged to be coached by Brumbies players with 7 attending each camp. These players include David Pocock, Steven Moore, Robbie Coleman, Fotu Auelua, Jesse Mogg, Scott Sio and 8 other players who will be spreading themselves over both camps for position specific training. Registrations close on Friday 5th of September. Link, information flyer & registration form below - to be held in the October School Holidays. Contact Thomas Beinke (T.Beinke@brumbies.com.au) or Daniel Hooper (d.hooper@brumbies.com.au) for more info. 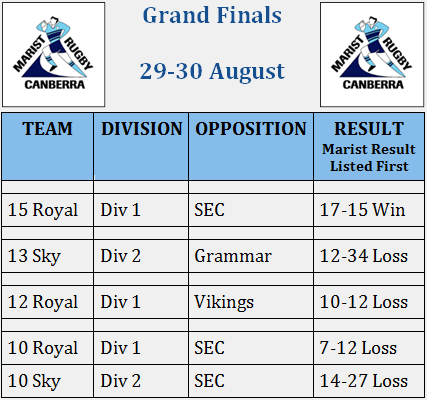 Congratulations to the five Marist boys who have been selected in the ACT Open Schoolboys side to play in the Australian Schoolboys Rugby Union Championship at St Ignatius Riverview in Sydney starting this week. They are Lewis Oswald, Suita Timote Tai, Tom Evans, Liam Simonsson and Samuel Ross. See full team details here. What, no rugby (Queen's Birthday weekend)? There are two refereeing kids courses on two different days. Adult referees are also welcome and wanted! You need to be turning 13 this year or be older to attend. Students earn $20 a game. 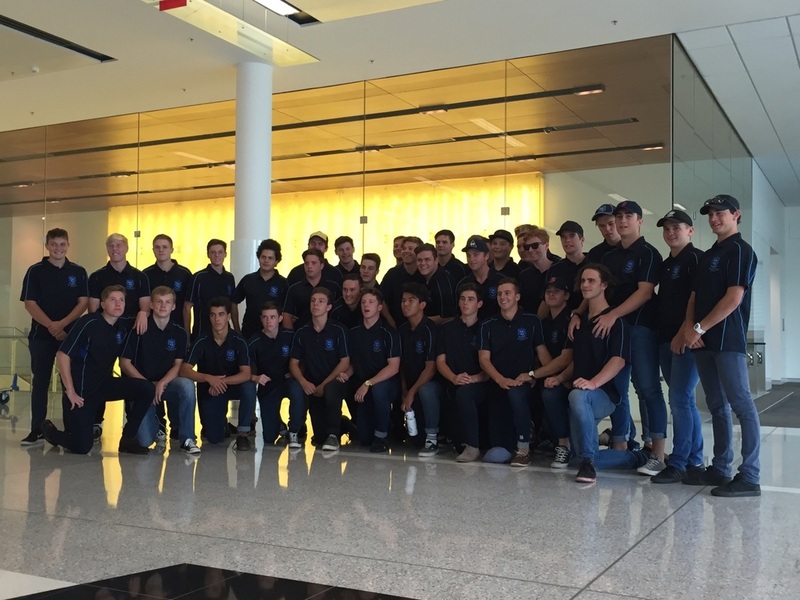 Appointments are made to fit around playing and travel commitments. Parents who would like to try refereeing also are welcome to attend. CONTACT – Caitlin Ryan c.ryan@brumbies.com.au to confirm your attendance. You need to be turning 15 this year or be older to attend. Cost for course $77 but reimbursed once you become accredited. See below for information on upcoming clinics in ACT (first attachment) and Southern NSW (second attachment) for Boys and Girls U8-U13. Be up to speed - know the new rules. Canberra Times Article 13 May 14 here. * Players can return to the field once a lead is cut to 20 points. * Maximum of three players off. * Only applies to ages under-13s to under-18s. 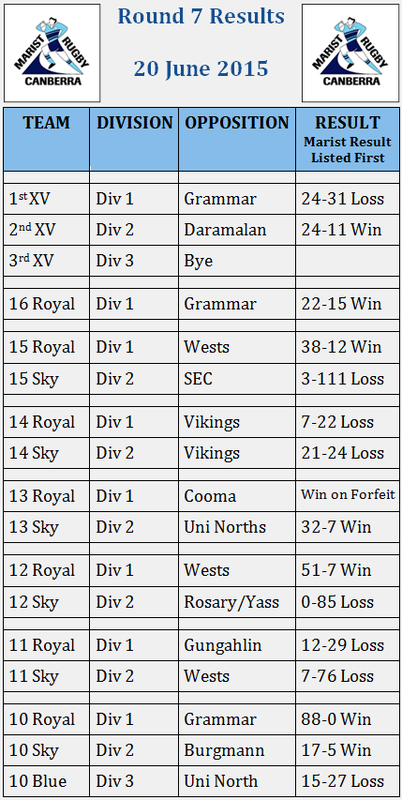 * Under-12s and below must maintain even numbers on the field. 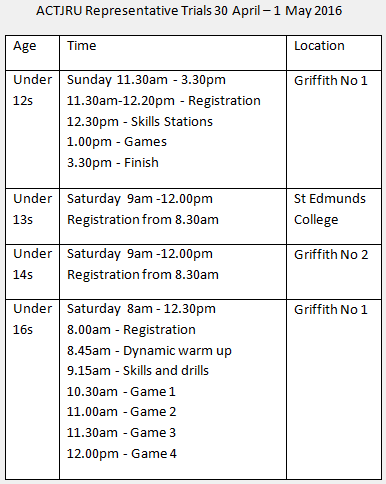 See the attached document for your age group training days, times and venues as well as the Coordinator for the group.